While cabinets, appliances and fixtures are important parts of any kitchen, we all know that it is the countertops that bear the brunt of our daily lives. 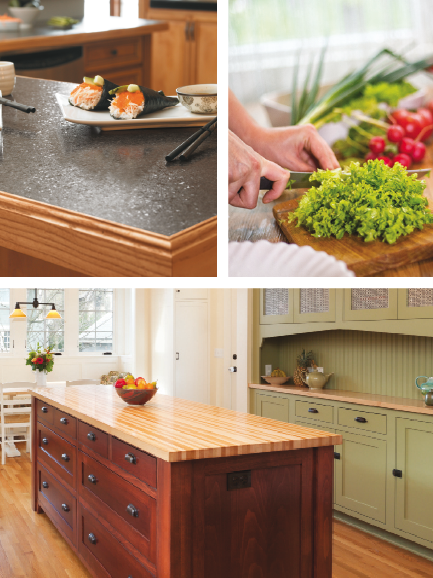 From fixing that first morning cup of coffee, to mixing, chopping, and assembling meals, to serving as a buffet or homework station, countertops are the one part of your kitchen that gets nearly constant and varied use. If you’re in the market for a countertop update, it’s important to evaluate all of your choices for this all-important kitchen feature, gathering as much information as you can. After all, today’s countertops are made to last for decades, if not generations, so this could be a long-term relationship. It’s easy to fall in love while watching a cooking show, with say, a Carrera marble countertop, as the show host enthuses about how wonderful it is for rolling out dough. But despite its beauty (and handiness for pastry-making), is Carrera the right choice for your family’s countertops? 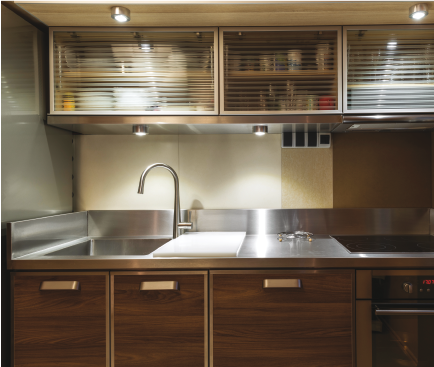 What about a sleek, stainless-steel prep area, or a rustic butcher block top? Countertops offer large expanses of flat space that will immediately draw the eye. In fact, countertops are often the first thing most people will register when walking into a kitchen for the first time. 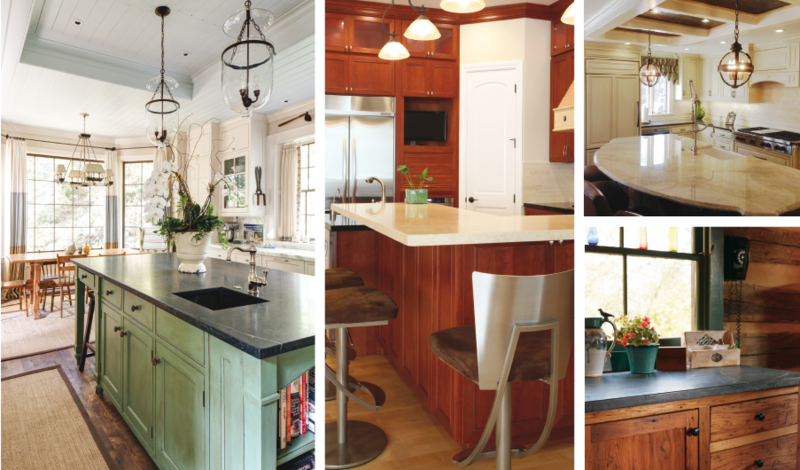 Savvy buyers, looking to replace an old countertop or install a new one, will have one eye on the functionality of a material, but another on the aesthetics of their material of choice and how it works within the decor of the kitchen and the home itself. Today’s homeowners are fortunate to have so many choices when it comes to countertop materials, from real quarried stone, to manufactured stone, to solid surfaces, to laminate … your choices are nearly endless—and possibly overwhelming. We’ve heard that “natural finishes” are a popular trend, and indeed granite and other stones seem to be perennial favorites for countertop materials in our area. However, new materials are giving trusty granite a run for its money. Page Eggleston of Spectrum Stone Design, for example, says that quartz, or engineered stone, is now challenging granite as their number-one seller. “People are going for softer, lighter natural colors, and less busy patterns in their surfaces,” Eggleston explains. “Quartz is able to replicate the solid-colored, light stones, such as marble, without the concerns of etching, staining or chipping often associated with the softer natural stones.” Natural or natural-looking surfaces are enjoying tremendous popularity at the moment, but there are many ways to get a natural looking countertop without investing in stone. With modern manufacturing techniques, many of the manufactured solid surfaces, and even laminate, can look practically indistinguishable from real stone, perform beautifully for years, and have price points to fit almost every budget. Additionally, there are some breathtaking alternatives to granite that are worth considering depending on your family’s needs and tastes, including stainless steel, wood, and even concrete. So which surface is right for you, your kitchen, and your family? Natural stone remains the number-one choice for countertops in our area. Unmatched in beauty and completely unique, every slab will have differences in pattern and hue, complements of Mother Nature. Because of this uniqueness, natural stone will never look completely uniform or color-consistent. This is seen as a strength to some, and a drawback to others. Chris Hargis of Pinnacle Cabinetry explains that, while some people may be frustrated by stone’s lack of uniform pattern, particularly when trying to match countertop materials at the inevitable seams, most find that the natural beauty is worth it. “It’s like art you look at and use everyday,” he says. “Softer” stones, like marble, limestone or soapstone are also very popular choices, due to their color and texture. But often, because of their softness, they will chip or scar in the daily wear and tear of family life. With its matte finish and soft “soaplike” feel, soapstone is a perennial favorite. Soapstone is particularly popular in our area of Virginia, as we are home to the sole soapstone quarry (Alberene in Nelson County) left in the United States. 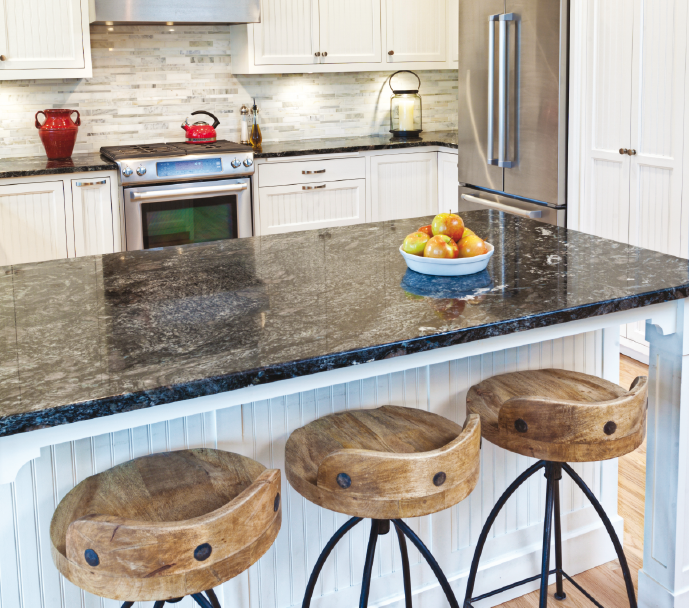 In Virginia, soapstone is the “buy local” of countertop materials. Tracy Kearney of Cornerstone Cabinets in Lynchburg acknowledges the popularity of marble and soapstone in particular, but recommends caution when choosing softer natural stone countertops because of their susceptibility to scratches and chips, and, particularly for lighter-colored stone, such as Carrera marble, which can be frustratingly prone to staining. “There are many more durable alternatives out there,” says Kearney. For those who love light-colored natural stone, Kearney suggests investigating quartzite. “It’s a natural quartz rock,” she explains, “which is also extremely strong and even slightly translucent.” She recommends this beauty for smaller areas, or as accents, due to its expense and smaller sheet size. 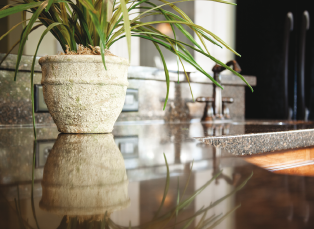 In recent years customers have been given more choice about the surface finish of their natural stone countertops. For those who are looking for something a little different from the glossy, polished stone look, fabricators are now offering honed, matte, or “leathered” finishes that are increasing in popularity. Whatever finish you choose, keep in mind that all natural stone will need to be professionally sealed before installation, and depending on your stone, at regular intervals in the years to come. For most natural stone countertops, subsequent sealing can usually be done easily by the homeowner. Engineered stone, as its name implies, is indeed real stone (usually 93 percent reclaimed marble, granite or quartz) that is finely ground, and mixed with a durable binding material. The engineered stone products of today display the beauty of the natural stone they are made from, yet are very uniform, which makes it easier for installers to hide seams, and they are slightly easier to fabricate and install. Different manufacturers such as Caesarstone, Silestone, Cambria and Hanstone specialize in mimicking specific natural stone, explains Eggleston. 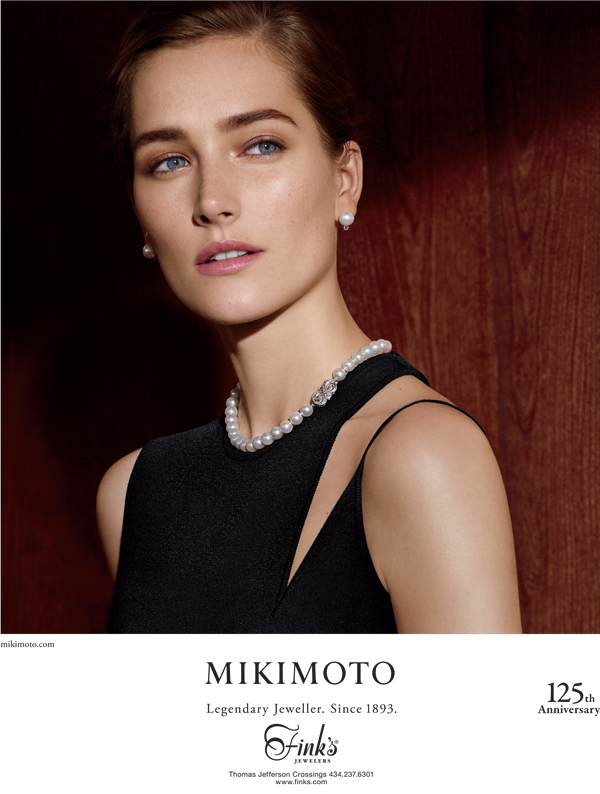 “It’s rather like blue jeans manufacturers, in that everyone has their niche,” she says. Eggleston has also noted an uptick in popularity of quartz that comes in the soft, neutral colors of Carrera marble or limestone. As homeowners are tending to prefer a lighter, brighter surface for their countertops, they can opt for the durable quartz lookalike, rather than putting in marble and stressing about stains every time they pour a glass of wine. “Also, it’s hard to find granites in soft colors,” Eggleston says, “but with quartz, the possibilities are plentiful.” Her one caution is to avoid putting anything hotter that 350 degrees on quartz. “It’s in the fine print from the manufacturer,” she says, “so I always recommend care with super-hot cookware.” With its non-existent maintenance requirements, natural look, and excellent durability, it’s easy to see why quartz is the “up and coming” material for many of today’s countertops. 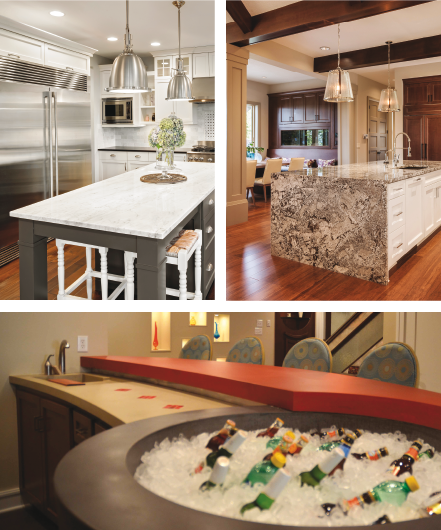 Synthetic solid surface countertops are made of polyester resins, acrylic and pigments. They stand up to natural stone and engineered stone in terms of durability and often come with generous warranties. They are completely non-porous, and stain-, mildew- and germ-resistant, and these days can be made to look like virtually anything from stone, to copper, to beach sand. For those with a strict decorating palette, the color choices are extensive, and can come in finishes from glossy to matte. While synthetic solid surfaces shouldn’t have hot pots or pans placed on them, and shouldn’t be cut directly upon, it is a simple matter to buff out most light scratches and homeowners appreciate that there is zero maintenance for these countertops. solid choice for a DIY countertop project. These days laminate comes in every color under the sun, including patterns and finishes, and if treated gently (no cutting directly on laminate, and don’t place hot dishes or pots directly on in) will stand up to years of use. Concrete is no longer just a material to be used in foundations and flooring, but is becoming increasingly popular as a countertop material. Concrete can be poured into any shape, and is often a “green” choice due to its use of recycled or recyclable elements such as glass and aggregate. Concrete is naturally porous and needs to be carefully mixed to minimize chipping or stains, and professionally sealed to preserve its durability. But in terms of shape, texture and color, it is almost endlessly customizable. The thing that often attracts homeowners to trying out this versatile material in their homes is that objects such as shells, glass or metal can be actually manufactured into the countertop itself, making for an ultra-customized countertop with heirloom potential. Stainless steel is the material of choice in commercial or industrial kitchens, but it is increasingly becoming popular as a countertop material in residential kitchens as well. Prized for its durability, it has found a new place in the sleek, modern-industrial look which is very popular today. Taking its place next to the stainless appliances that have been popular for years, stainless steel is relatively easy to install (professional installers will “wrap” it around a backing material like plywood to give added strength and to attach it to the cabinets). Stainless has practically no upkeep and is easy to clean. It doesn’t scorch, stain or mildew, and scratches can be buffed out easily, though dents can sometimes be a problem. Stainless is 100 percent recyclable, making it an earth-friendly alternative as well. Other than the material itself, what else can affect the price of your new countertops? Pricing of most countertops is done by square foot. There are three basic things that affect the pricing of your countertop material. First, the availability and location of the material: If you choose limestone from India, for example, you can expect the per-square-foot price to reflect not only the stone but the quarrying and transport costs for the stone. Second, the complexity of your design, including sink placement and countertop inserts like integrated drain boards and trivets, affects the complexity (and therefore cost) of fabrication. Finally, your choice of edge for your countertops—round, ogee, bevel, bullnose, waterfall and many more depending on your fabricator—will affect your final price. Just be sure you know what is included with your per-square-foot price and what might be an upcharge to avoid any unpleasant surprises when the bill arrives. It’s also a good idea to ask about warranties available for the material and the installation, just in case. A countertop is an investment and one you’ll likely have a long-term daily relationship with for many, many years. Like any relationship, you are wise to know its strengths and limits before going in. Before committing, it is important to ask questions and be certain that you choose the material that best suits your family’s needs before placing an order. Choose wisely, and stay on top of the recommended maintenance, and your countertops should reward you and your family with years of good service and good looks. My wife and I are very excited to begin our next home project. We are going to redo the kitchen, and most importantly, the counters. I like that you mentioned that no slab of natural stone will be exactly the same, because they are natural and not manufactured. That is something that really appeals to us, so we will have to look into it. After reading through all the information in this article, it seems to all come down to personal preference when choosing a countertop. I thought it was really interesting to learn how quartz is made. My friend has some wilsonart countertops that I think match her kitchen well and is made out of quartz, so it was fascinated to learn more about it. Awesome post! Indeed marble enhances the beauty of the home and protects the value of the home. These countertops are durable and scratch proof.